Winding his way back to Australian shores with brand new fourth album Hearts That Strain tucked under his arm, Nottingham native Jake Bugg has definitely learned a thing or two from five years of constant recording and touring. To call him a veteran at the tender age of 23 might be a bit of a stretch, but a catalogue of tunes as diverse as they are thrilling speaks volumes for this prodigiously talented troubadour. 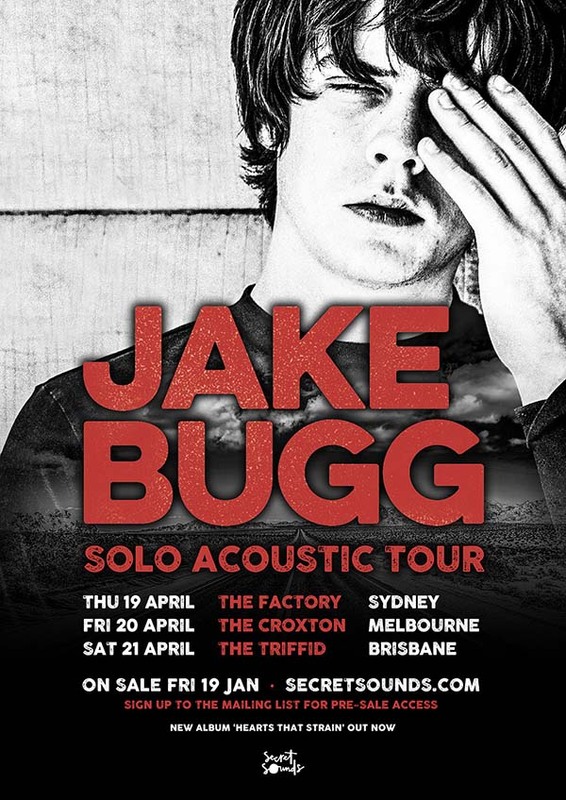 Hitting Sydney, Melbourne and Brisbane for three huge solo acoustic shows, Bugg is well known to audiences down under for his boundless energy and shopworn tenderness, with his visits always attracting fevered excitement from both locals and ex-pats alike. Recorded in Nashville with Black Keys frontman (and super producer) Dan Auerbach, Hearts That Strain shows a side of Jake Bugg rarely revealed on his previous three studio albums. It could be the secrets of the road or maybe just one too many drives through the American South, but there is a distinctive country feel running throughout songs like How Soon The Dawn and Waiting. The latter even features a duet with Noah Cyrus - of that Cyrus family. Yep, Billie Ray’s other daughter does her Daddy proud on a heartbreaking piano ballad that shows just how far Bugg has come from his early days hurtling through breakneck numbers like Lightning Bolt and Trouble Town, not that he doesn’t enjoy levelling the odd audience with these early gems. In fact, it’s his ability to mix countrified crooning with raucous romping that makes Bugg such an undeniable presence on stage. These effortless twists and turns have seen Jake Bugg cultivate an adoring fan base across the world and especially here in Australia. All four of his records have hit the Top 10 in his native UK and he will surely be welcomed to Australia with open arms for this latest run of shows.